Braves Game and a Very Happy 4th! At first I wasn’t so sure how I felt about the 4th of July falling on a Wednesday. If it had fallen on a Tuesday or Thursday, we likely would have had a four-day weekend. It also meant we wouldn’t be able to go to Centennial Park to watch the fireworks show…unless we wanted to stay up until midnight or later and then get up at 6 A.M. for work (uhh, no). It just seemed strange to have the day off work right smack in the middle of the week. However, it was actually surprisingly nice to have a mid-week reprieve. Plus, it’s only another two days until the weekend! 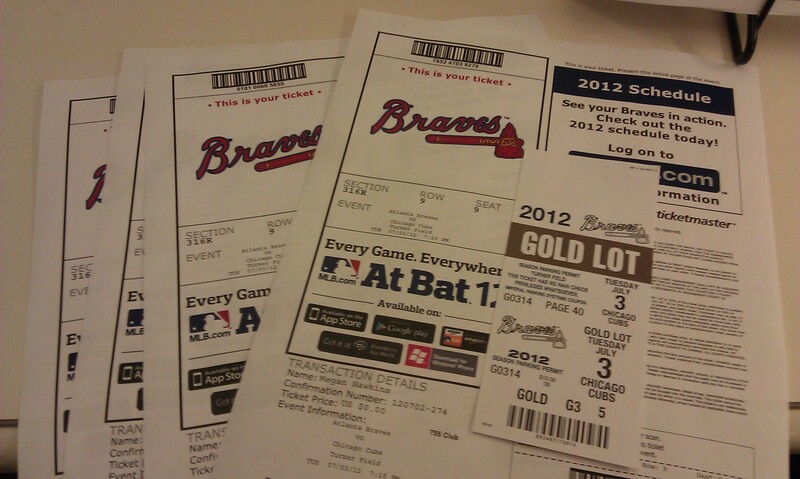 Our Braves tickets, compliments of my work buddy, Dave. 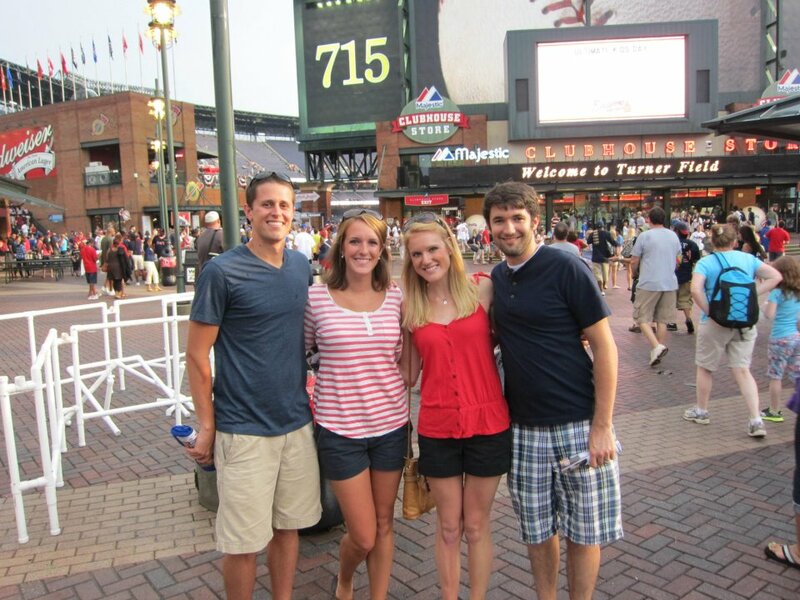 We kicked off the holiday right by going to our first Braves game of the season Tuesday night. Drew’s friend PJ, and his girlfriend Lauren, were in town for a few days so we figured a baseball game would be the perfect outing for the four of us. My awesome cubicle neighbor Dave was able to set us up with some free tickets that actually turned out to be great seats. (Thanks Dave!!) It had been storming on our way to the game but our seats were under an awning so even if it started pouring again, we’d stay dry. 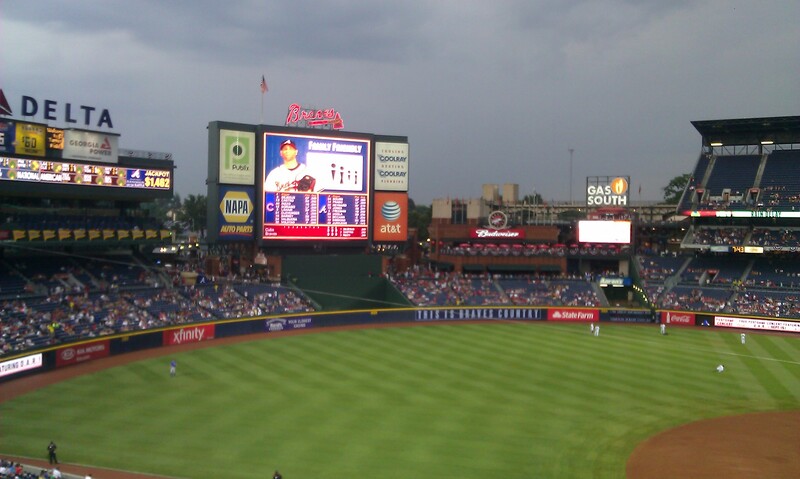 Thankfully the rain stayed at bay and we were able to enjoy a great game-and a Braves victory. The four of us braving the rain at the Braves game. Heh heh, get it? The view from our seats. The sky looked ominous, but thankfully the rain stopped just before the game started. Even though we had the day off, we woke up on Wednesday morning not much later than we typically do on a weekday. The ACJ Peachtree Road Race—the largest 10K in the world with over 60,000 entrants—was taking place just a few blocks from our apartment. We jogged over the corner of Peachtree and 10th, watched the runners for a while, and continued on our own run around the course. We passed through the park to see all the runners come through the finish line and we were absolutely amazed by how many people there were. We thought the Color Run was huge, but this race had a good 20,000 more people! As much as I don’t like big crowds, I’m darn determined to run this race with Drew next year. It sure looked like a lot of fun! 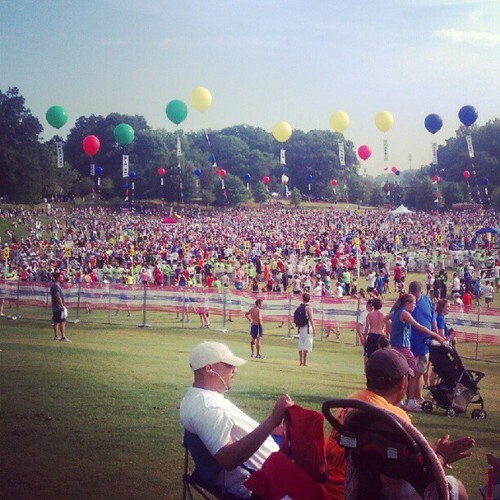 The crowd of finishers at the AJC Peachtree Road Race. I want to run it next year! After a quick jog back home, I served us up some patriotic blueberry pancakes. Drew actually had chocolate chip ones (surprise, surprise). After breakfast we took advantage of the day off, pulled out the couch into a fold-out bed and took turns between watching Netflix and napping. Theo loved having us home and nestled himself right in the middle of us, tucking into the covers and asking demanding to have his head scratched. Several of the couples from our house church group came over to meet up and walk down to Piedmont Park together. 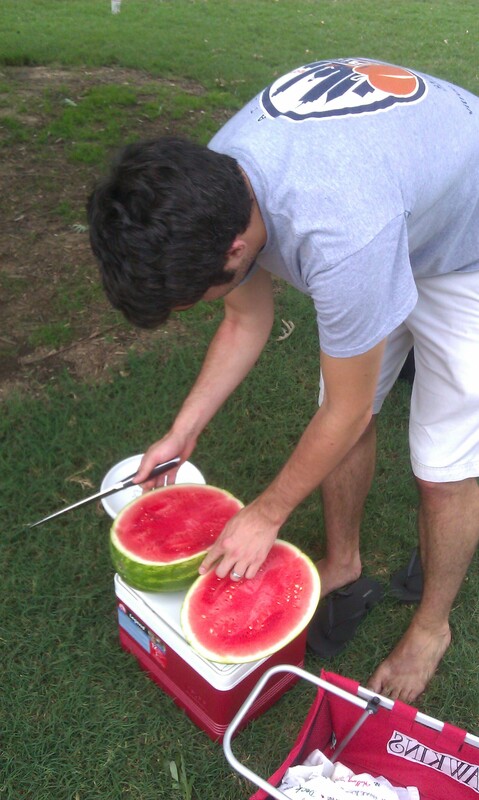 Our apartment is maybe a half mile walk from the park entrance, but when you’re carrying heavy coolers and watermelon, it sure feels longer than that! We set up our picnic sight right under a tree, put down our towels and immediately set up our food and drink spread. 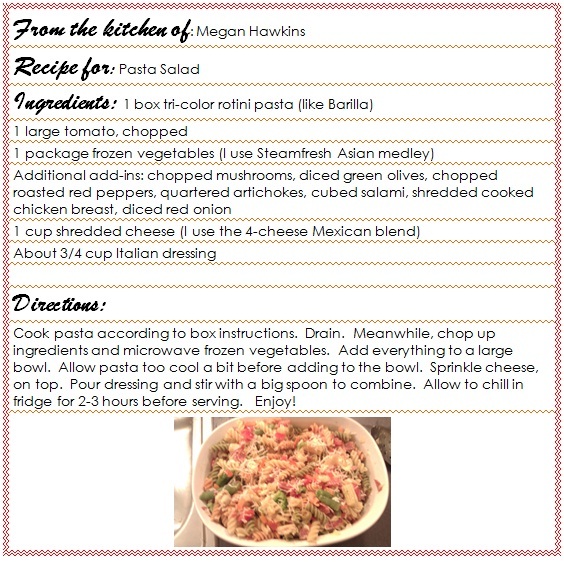 I made a pasta salad which is my go-to for picnics and BBQ’s, and have provided the recipe below 🙂 Some of the guys played Frisbee while the girls sat around and chatted. 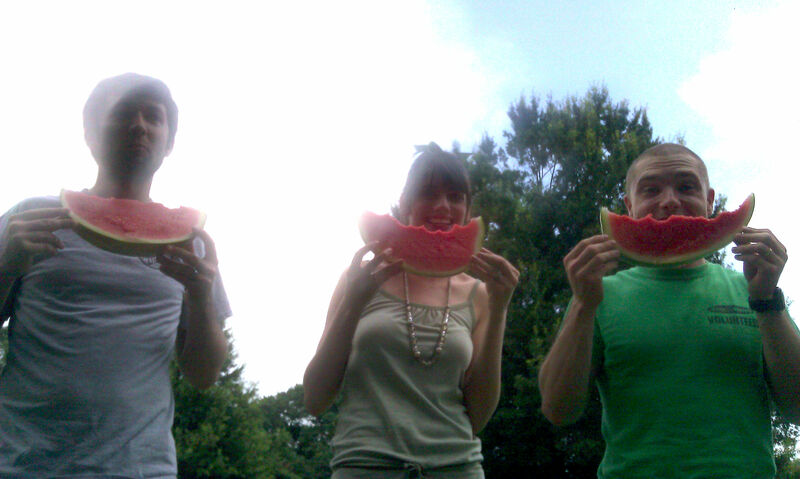 After Drew chopped up the watermelon like a champ, we had a watermelon eating contest. Elle was definitely the winner! Once it started getting darker, we set back for the apartment. Some people were going on to watch the fireworks but we tidied up the kitchen a bit then headed straight to bed. I thought we might hear some of the fireworks, and was actually curious as to how Theo would react to them, but I was asleep before I knew it. 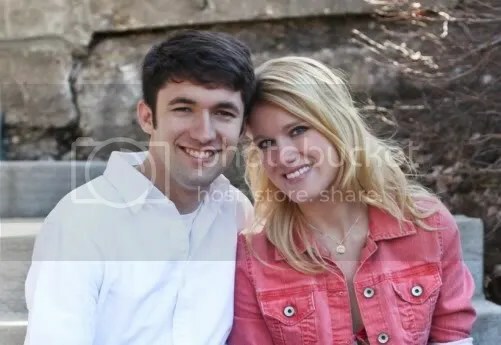 I commented to Drew that the day seemed to last a long time, which is definitely a good thing. We had a great time watching the race, taking it easy, and spending time catching up and enjoying good food with our friends. After today, only one more workday separates us from the weekend. Yep, having the 4th of July on a Wednesday turned out to be pretty nice after all! ← A Long Weekend at the Beach!